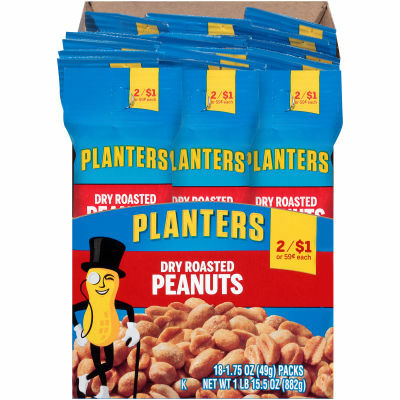 Dry roasted without the use of oil, these Planters peanuts are enhanced with sea salt, giving them a hint of salty flavor and the crunchy peanut texture you know and love. These peanuts are perfect for mid-day snacking, available in 18 convenient 1.75 oz. snack bags that can be grabbed on the go or effortlessly included in a packed lunch. These dry roasted peanuts are sourced in the United States and are ready to eat whenever you need a snack or energy boost.